Hanuman Gundi Falls in Chikalamagur is a spellbinding cascade that falls from a height of 22 meters, weaving a captivating sight around itself. It is believed that Sanjeevani Hill was located here and that Lord Hanuman arrived here searching for the miraculous tree, which could cure the fatally wounded Lakshman. This place is located 20 kilometers from Kundremukh and has a magical scenic appeal. This gives the tourists a wonderful opportunity to trek towards the fall and bathe in its refreshing water. 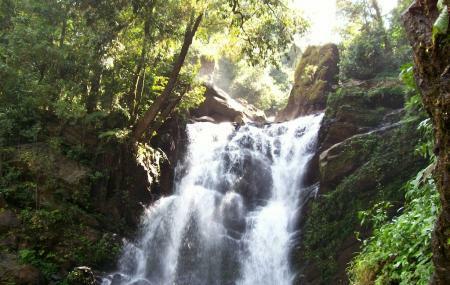 Also, visit the popular attractions in the city by following Chikmagalur itinerary 2 days. You need to hire a jeep as other cars cannot be driven on the rock path leading towards the falls. It is a waterfall. You can visit the place any time of the day. Aged people and expecting mothers should avoid this trek. By car from Chikmagalur and Srinegri. How popular is Hanuman Gundi Falls? People normally club together Sringeri Sharada Peetham and Kalasa while planning their visit to Hanuman Gundi Falls.